If you want to be a deer for Halloween, there are a number of steps you can take to ready yourself for the big event. You can secure the perfect brown jumpsuit, you can pick up one of our deer makeup kits, you can perfect your prancing, you can change your diet to primarily raw greens and vegetables, and you can practice standing very, very still without moving for minutes at a time. And these things will get you very, very close to turning into a deer. But you can't grow antlers. We're sorry—it's just not humanly possible (and believe us, we've tried). And antlers are pretty important to a total deer transformation. 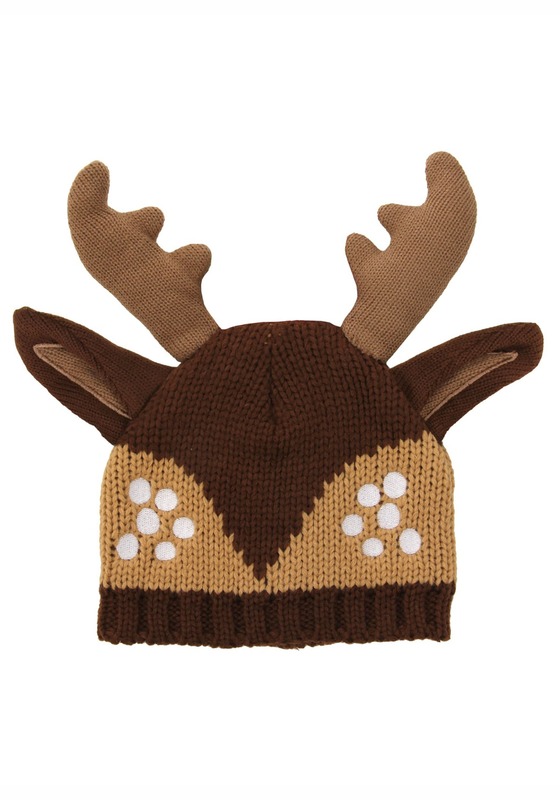 That's why we're happy to show you this Deer Knit Hat. It's a stocking hat style that will keep you cozy as you jump around, enjoying your Halloween party circuit! This darling hat is knit from two tones of brown—mahogany and tan—with sweet white spots to mimic a deer's coat. Little deer ears shoot out from the sides from the cap, and two stuffed antlers stick straight up from the top. Your deer look is now next level adorable, especially as you demonstrate your excellent silent, still stance for an impressive amount of time! So go ahead and turn tonight's dance party into a prance party! You've earned being the center of attention in this cozy cap that you're sure to fawn over!